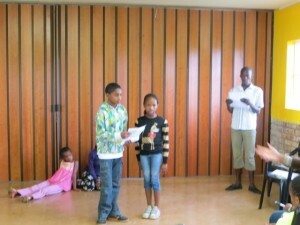 President Kwaikwai started these Monday evening Family Home Evenings and we have kind of become the leaders. 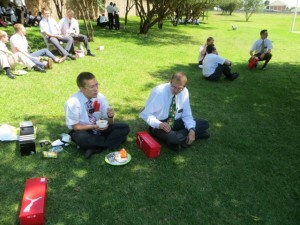 We plan to do this only until YSA leaders are called to take over conducting. 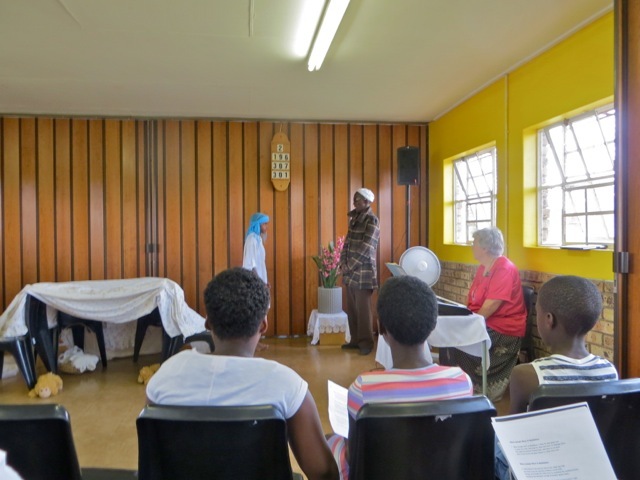 We have a short – 20-30 minute – spiritual lesson and then play some rousing games. 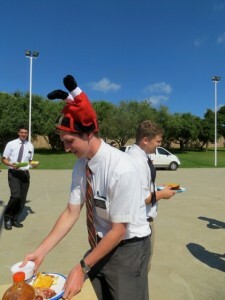 One of the favorite was played tonight – Book of Mormon Go Fish! 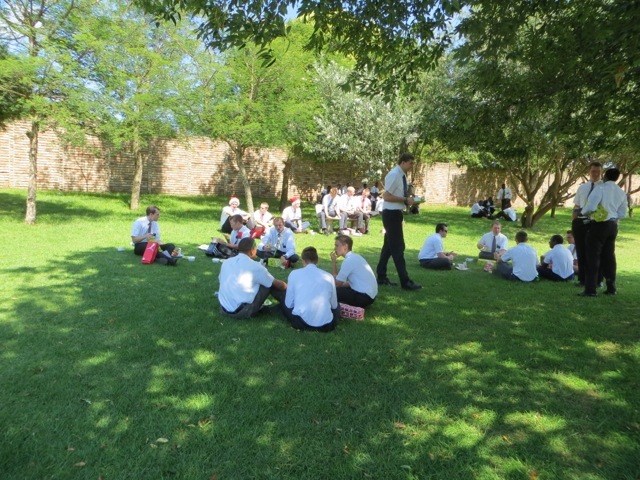 There is lots of laughter and we stop at times to talk about what the card that is being ask for refers to…like what is ‘the iron rod,’ or Nephi’s bow?’ So we have fun and learn at the same time. 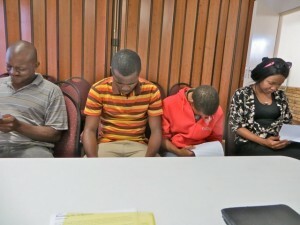 The young man in the striped shirt is an investigator who fits in so well it seems like he has been a member for a long time. This entry was posted in Johannesburg Mission - Back To Africa on December 29, 2014 by Bill. 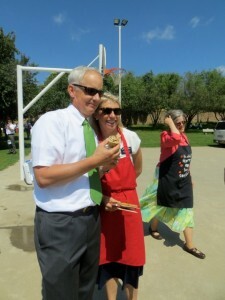 Well I am about a week behind in adding text to the pictures I loaded. 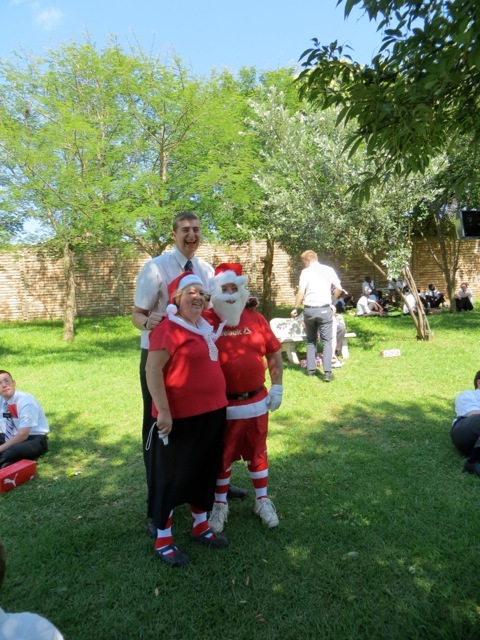 On Sunday December 28 we took part in the branch Christmas social – a couple of days after Christmas but no one complained. 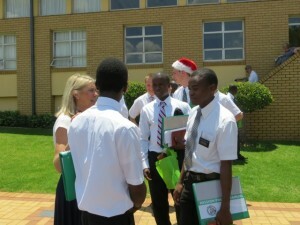 On Saturday before the program was presented we went to the school for the rehearsal. One interesting about the cast was that two of them were non-LDS who were just starting to take the lessons. 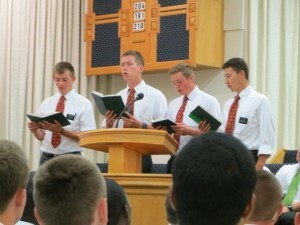 We had the largest attendance ever – 61 at sacrament meeting. 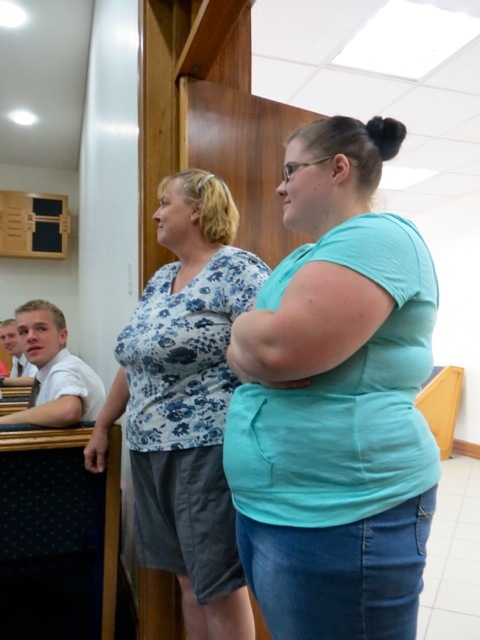 This included a number of investigators as well as non-LDS family members who came to see their grandchildren in the program or talk. 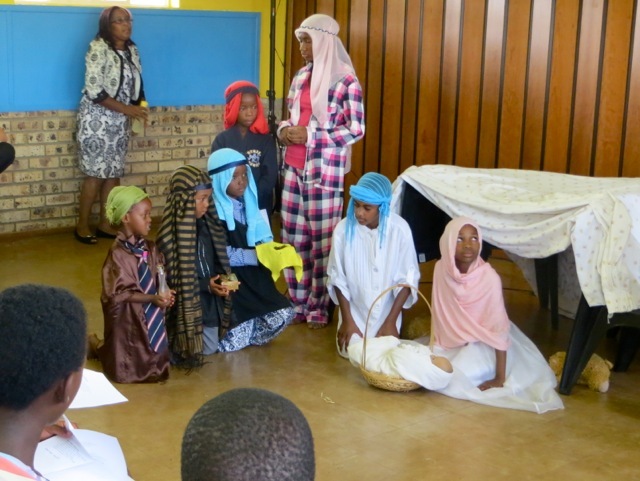 After the block meeting, we held a short program that included a lot of singing Christmas songs and then a re-inactment of the nativity as recorded in the Gospels. The angel and the Inn Keeper were the non-LDS members of the cast while Mary and Joseph have been members for only about a month now. 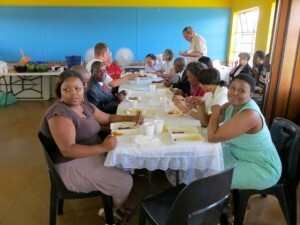 After the program there was a nice lunch that was prepared by a small committee but with lots of help in serving. There were lots of children and young men and women in attendance. 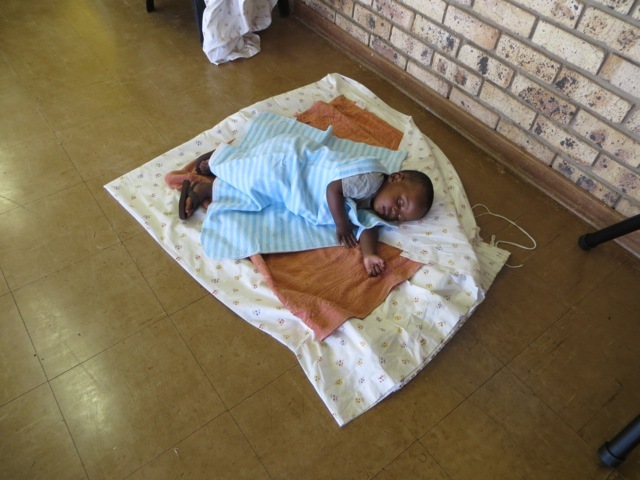 I think the young one sleeping below had the best of both worlds. 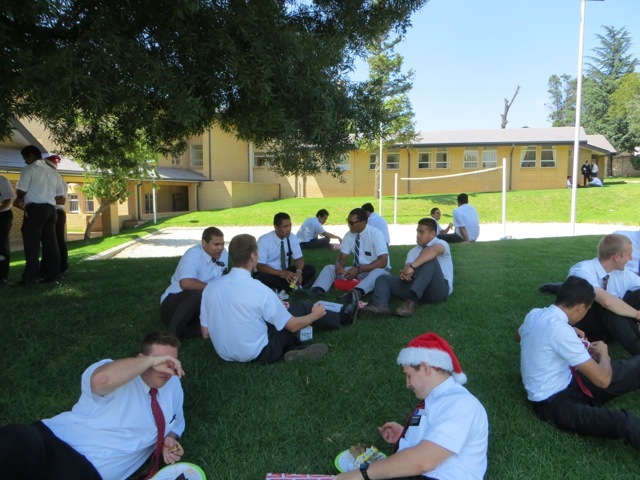 After the feast, members like always gathered together to talk. 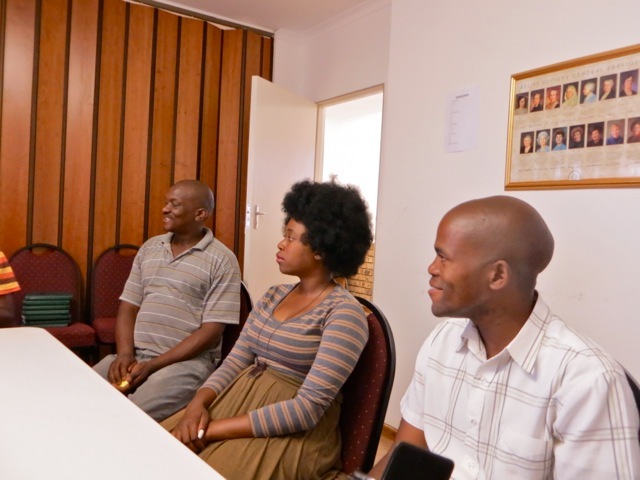 I walked in on a lively discussion about something but I never figured out what because they were speaking Tswana. Probably better I did not understand. 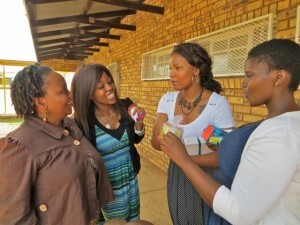 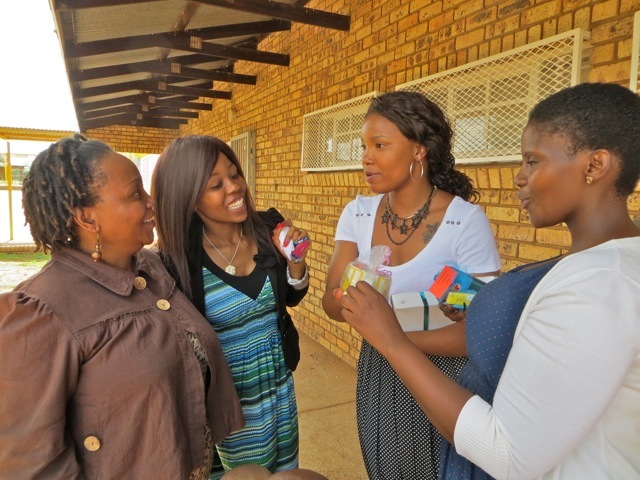 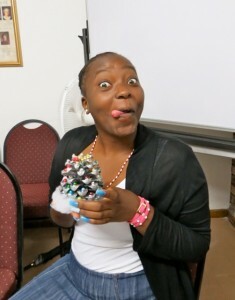 Our dear friend sister Thulo, who was on the food committee wanted her picture taken eating watermelon. 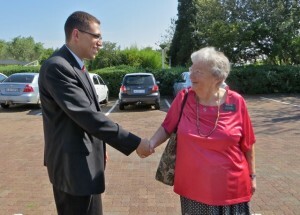 I am always happy to fulfill a request for a photo. By the time we did all this, got the rooms cleaned and put back in some kind of order, got most of the people on their way home, and delivered a couple of car loads of members to far away places, we finally got home some 8 1/2 hours after we had left it in the morning. 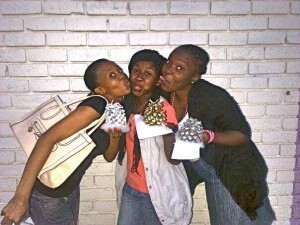 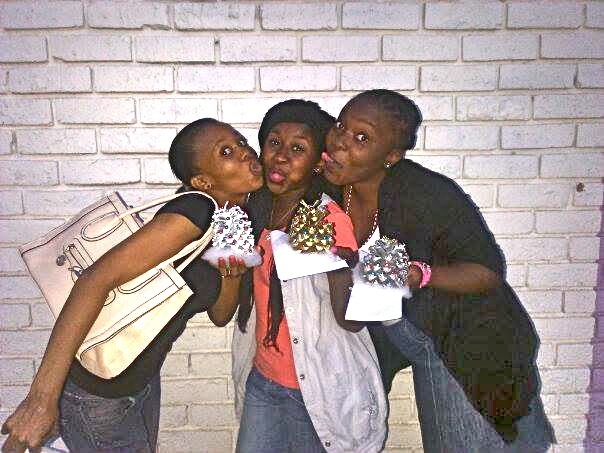 We basically came in and collapsed but with smiles on our faces for being able to be part of a very successful event. A Nice Braai with the Louws…. 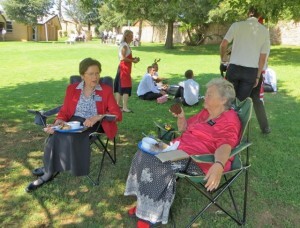 We went to Klerksdorp for district meeting and as usual enjoyed the time with the elders. 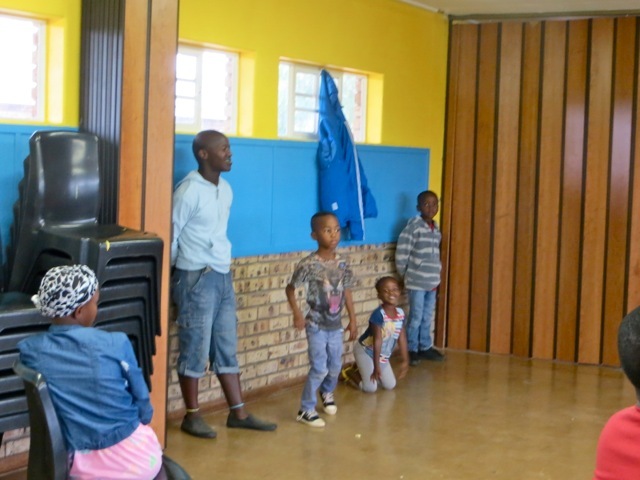 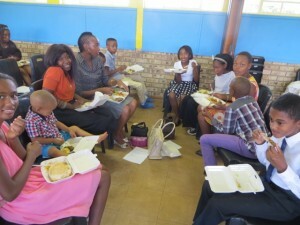 They are doing really well on learning how to lead music, a talent they can use throughout their mission and their life. 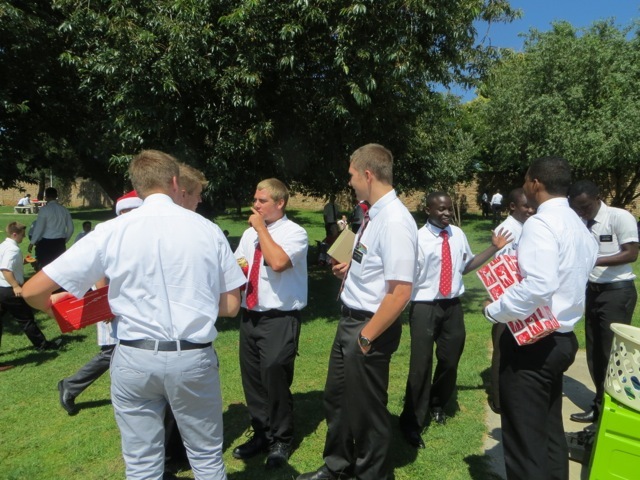 Even though the zone leaders, elder Reese and elder Togiatomai were with us, for some reason I did not take a single picture. 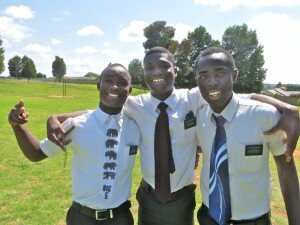 Which is a shame since this particular group of elders will not be together again before some are transferred. 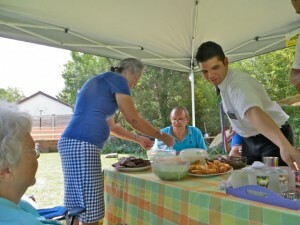 After the district meeting we went to the Louws for a traditional South African braai or BBQ as we would know it in the US. There was piles of food, good fellowship, and nice weather. as we were able to spend a couple of hours with this fine family. 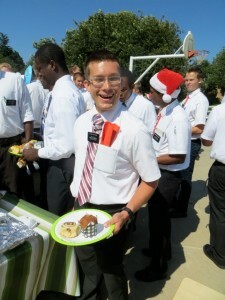 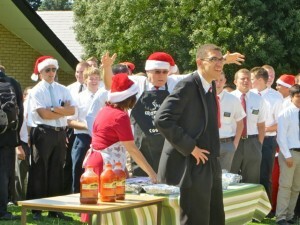 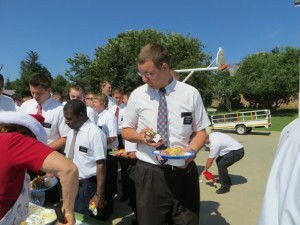 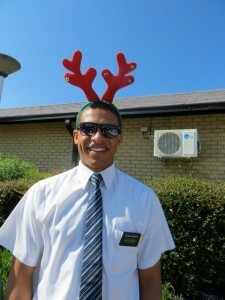 Since elder Togiatomai was on splits with elders Taylor and Liera he was able to join us for the braai. 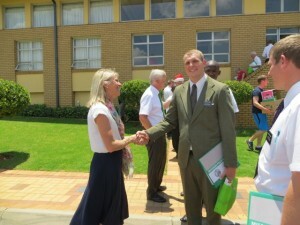 Also their nephew Gerhard was visiting from Pretoria. 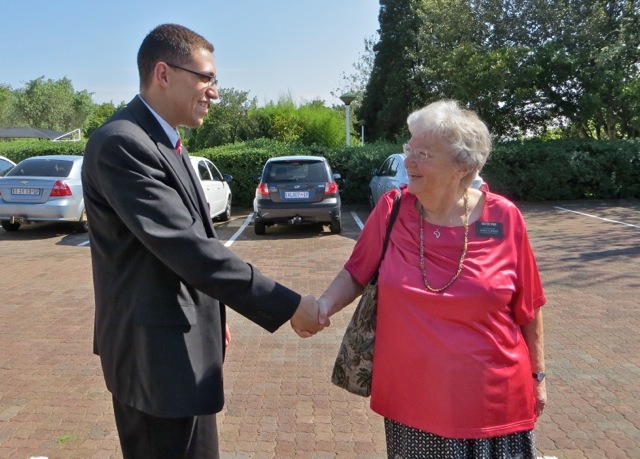 We had met him before when we went to the funeral for sister Louw’s father. 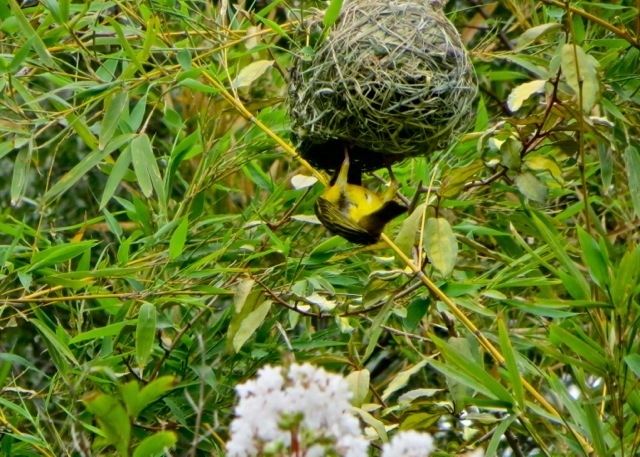 While we were eating and talking I noticed a yellow weaver busy with either entering a nest hanging in a nearby tree. I did not realize that the entrance of the nest was on the bottom. This got me to wondering why the eggs or young birds would not fall out. 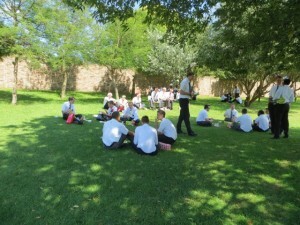 But obviously mother nature has worked this out or there would not be as many weavers around as there are. 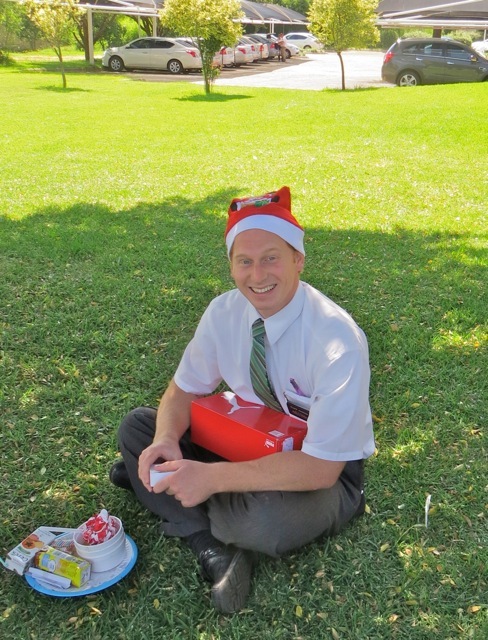 This entry was posted in Johannesburg Mission - Back To Africa on December 26, 2014 by Bill. As you can see from the smiles on the faces above, one of the most look forward to experiences on Christmas is the opportunity to call home and talk to family. 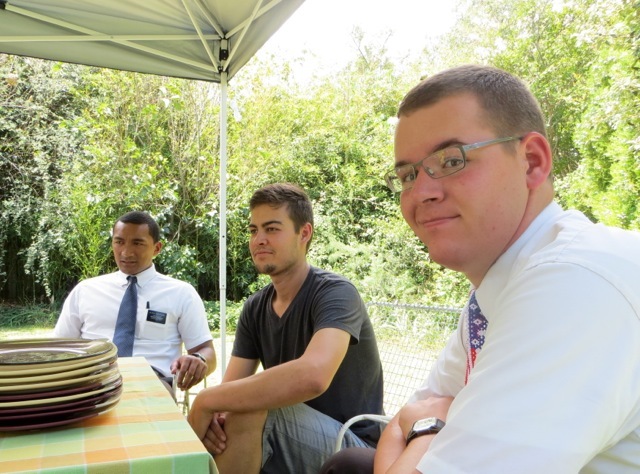 Now most missionaries use either Skype or FaceTime to make their calls so their family – mainly their mothers – can see and talk to them. 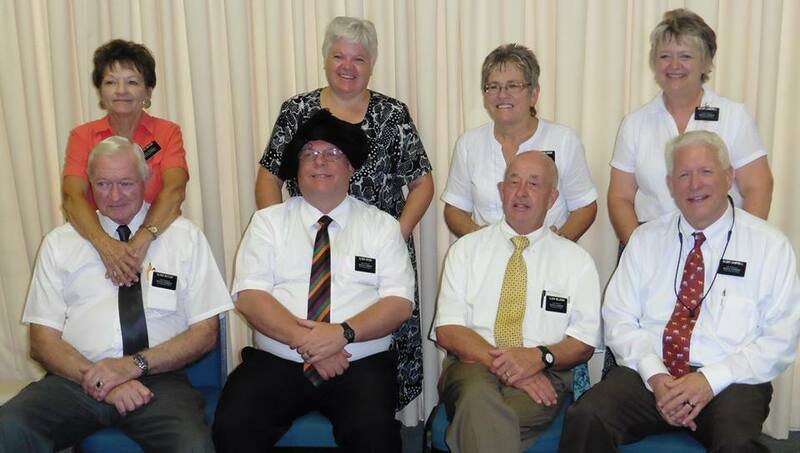 In many areas of the mission members invite the elders to use their computers to make these calls. 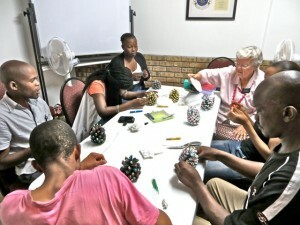 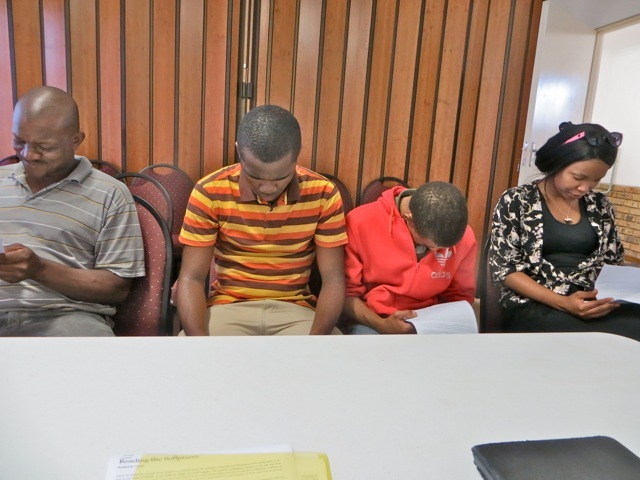 We invited the Potchefstroom elders over so they could use ours and have some privacy. 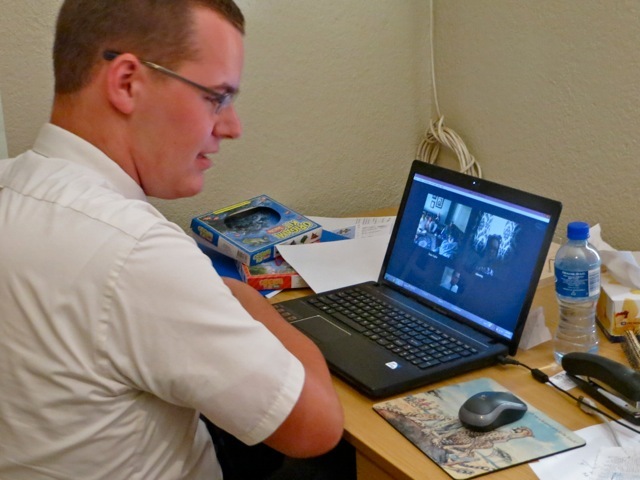 Elder Taylor was able to use multiple windows on Skype to talk to his family in different locations. Elder Liera mainly spent his time talking to his mom and dad. 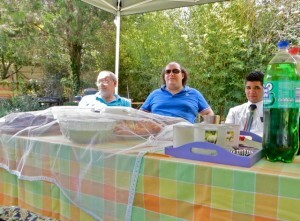 The hour passed quickly and with great reluctance they said goodbye and closed down the link. When the Johannesburg post office went on strike some time around August, no one thought that it would go on so long that it would basically stop the delivery of most Christmas packages and letters to the missionaries. However sister Shaw and her daughter realized that the missionaries in their stake were likely to not get any packages for Christmas. 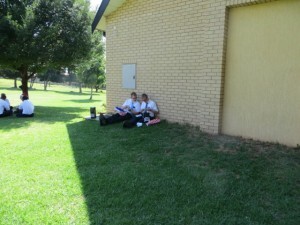 They decided that was not going to happen. 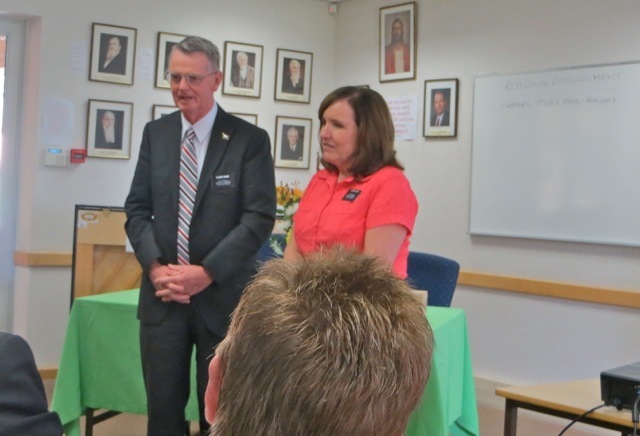 With the approval of President and sister Dunn not only did they organize packages for the missionaries in their area they contacted other stakes in the mission and found that everyone wanted to help. 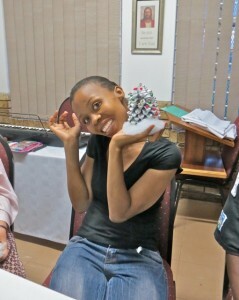 So many hours on many days was spent gathering, assembling and wrapping 150 packages. 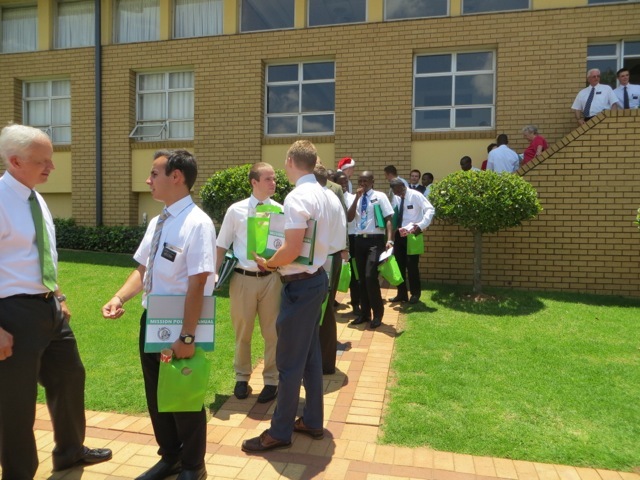 So due to the love for the missionaries and the generosity of money and time from throughout the mission, each missionary received from Santa a brightly wrapped package with an assortment of gifts. 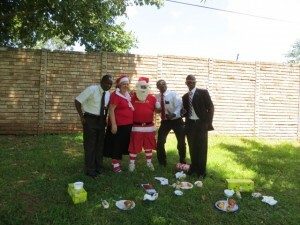 Truly this was a great example of the spirit of Christmas! 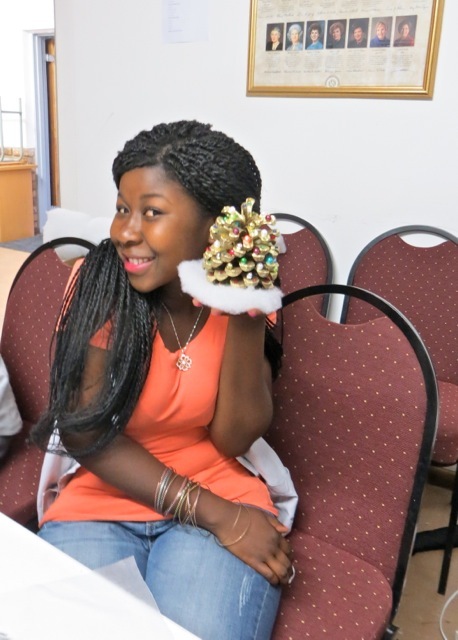 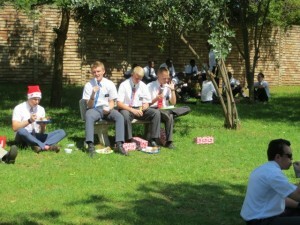 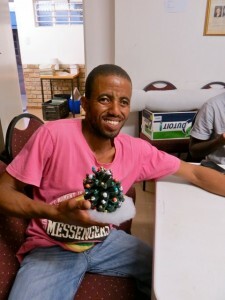 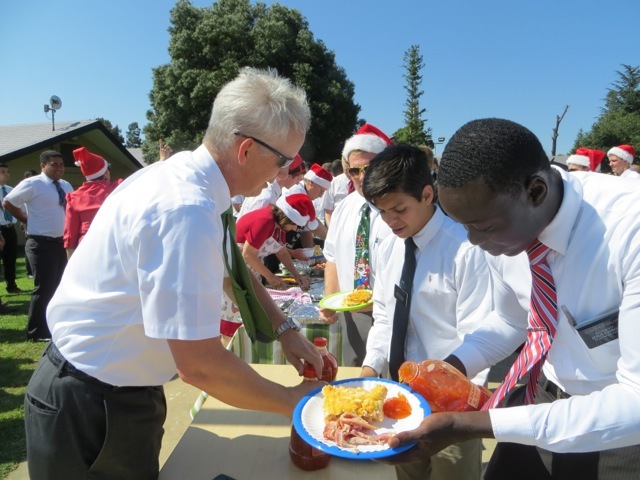 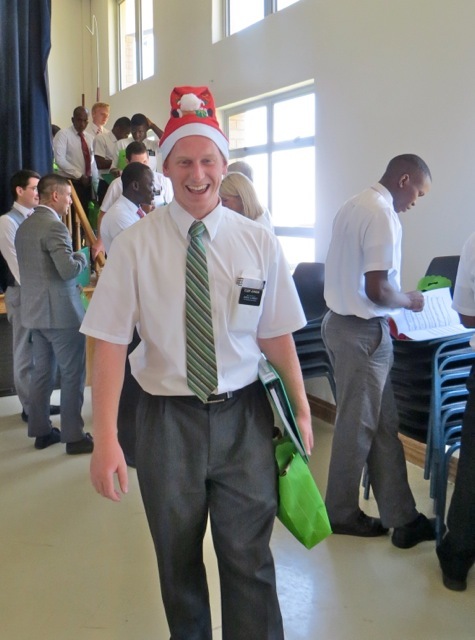 This entry was posted in Johannesburg Mission - Back To Africa on December 25, 2014 by Bill. 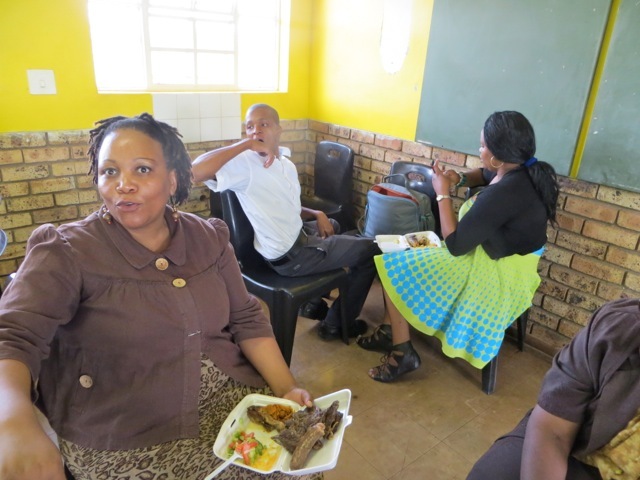 I wish I had pictures of each of the couples so you could see those who take care of your sons but here are some I do have. 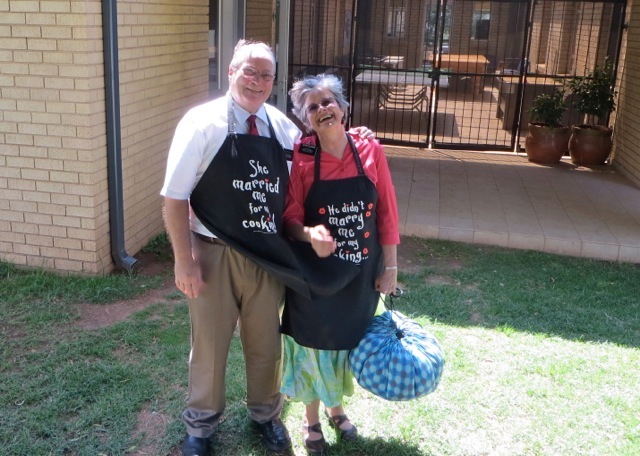 Sister Davies with elder Cloward…got to love his apron – sister Cloward’s said “The did not marry me me for my cooking,” which tells you a little about how much fun these two wonderful people are as they serve. The Hansens as the Clauses went around posing with the elders for Christmas pictures. 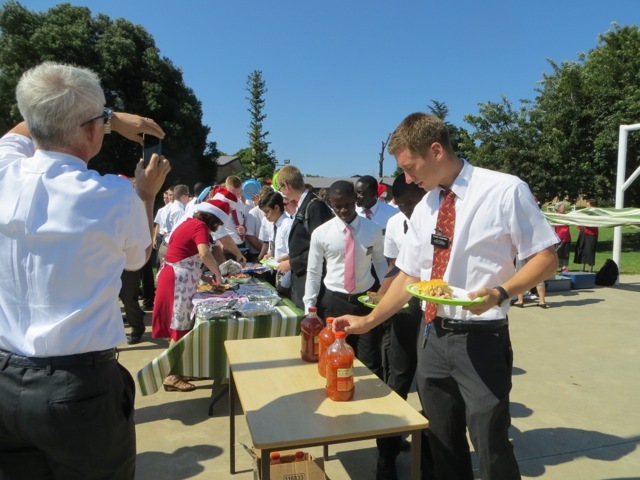 Elder Davies and the other couples were on the food line making sure the elders had plenty to eat. 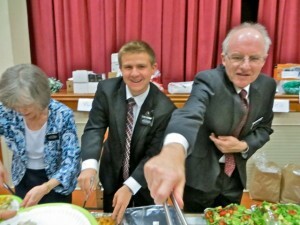 If you look down the row you can see sister Davies and elder Cloward dishing up the great omelette that was served. 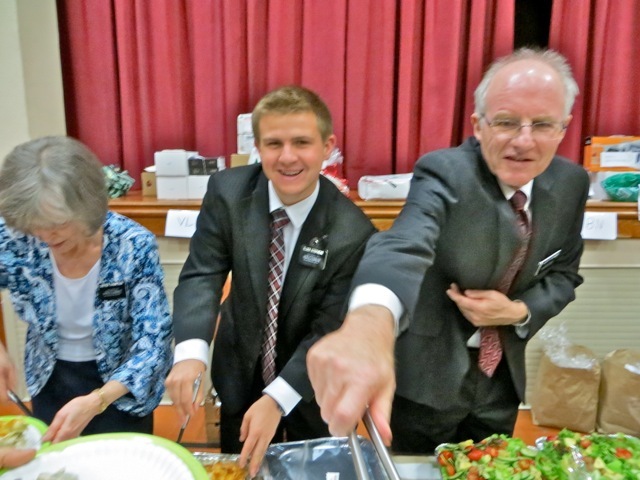 The only picture I have of the Thompsons together is this one of them once again dishing up food. 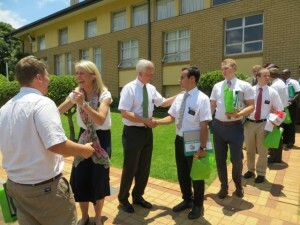 This was earlier this month during the mission tour conference with elder Cook. 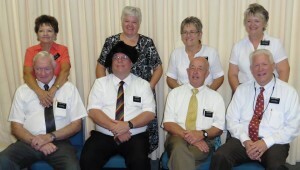 Here are the Davies together and also the Allreds who work so hard in the office. I must not leave out the wonderful couples who serve up in the Tanzeen area. 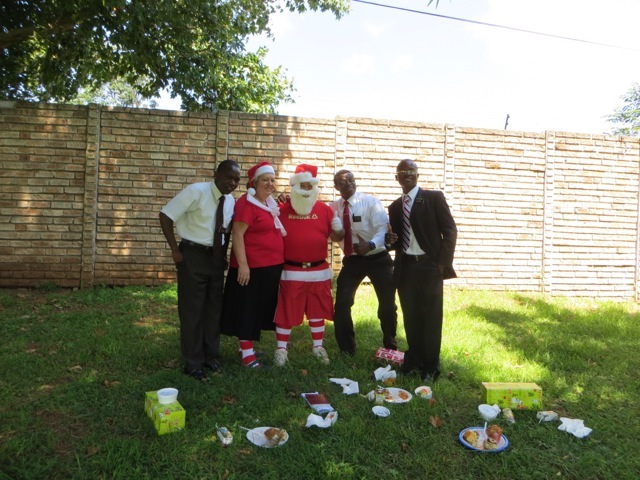 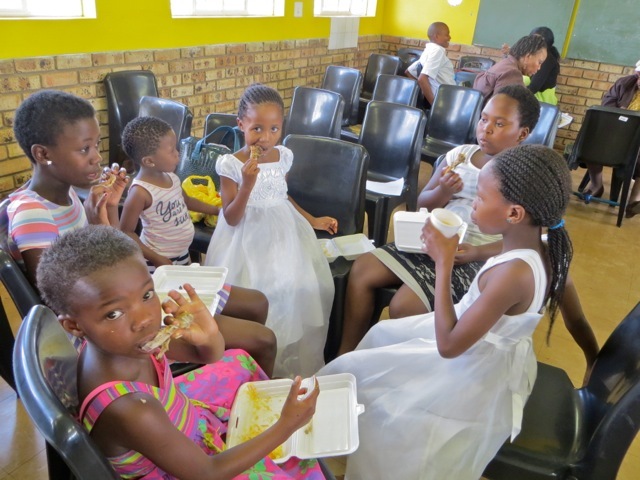 Since they are about 5 1/2 hours away from Johannesburg they held there Christmas gathering for the elders up there on Christmas eve. 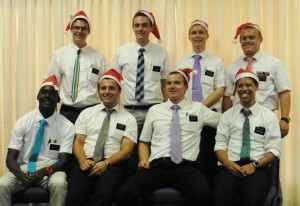 So these 8 elders had 8 great senior missionaries to serve them! 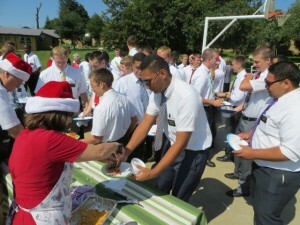 All of these are truly the unsung heroes and heroines of the mission as they did what ever was necessary to make sure the elders had a very Merry Christmas as they served away from their homes and their families. Although I only have 18 photos here – I was late to the party – President and Sister Dunn shook hands and wished each elder a Merry Christmas. 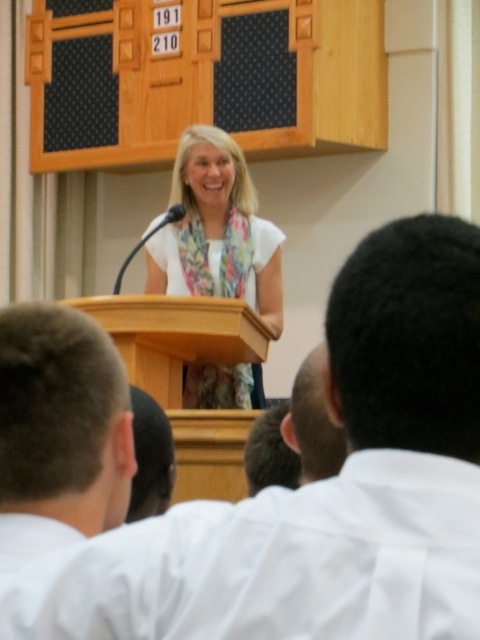 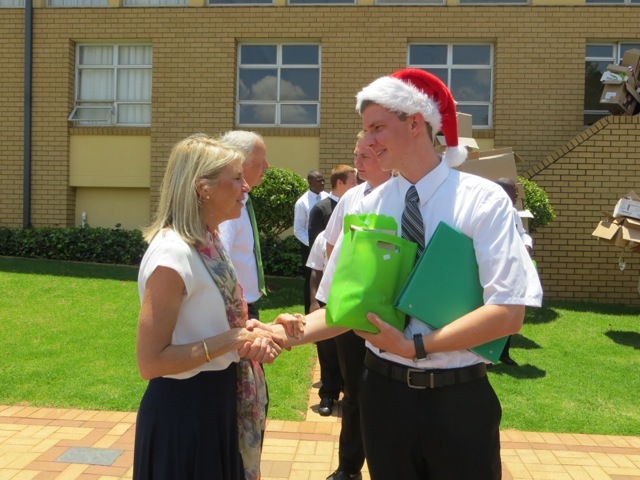 I also heard sister Dunn reminding them that if they had not already done it, to make their Christmas call home! 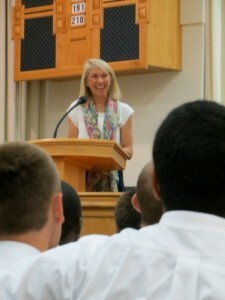 After breakfast we all went into the chapel where Sister Dunn mentioned that President Dunn asked her conduct. They are a perfect match and just right for the mission. The Ennerdale district was chosen to sing for the group – Elders Dutson, Thompson, Stilgoe and Gray did an excellent job of singing the parts. 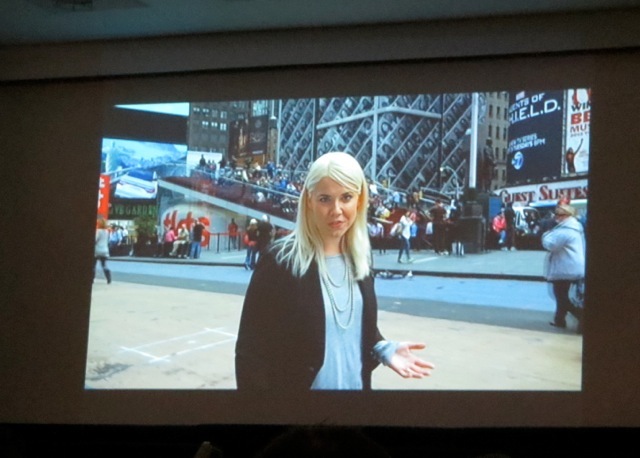 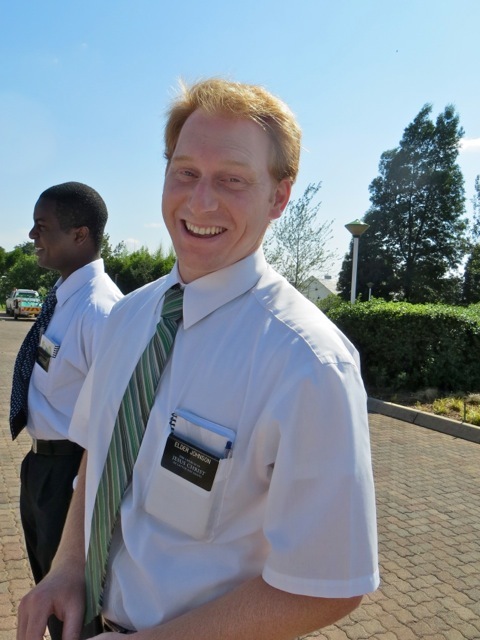 After the very short program president Dunn surprised us by showing “Meet the Mormons.” He used his contacts in the business to get a screening copy of the movie. 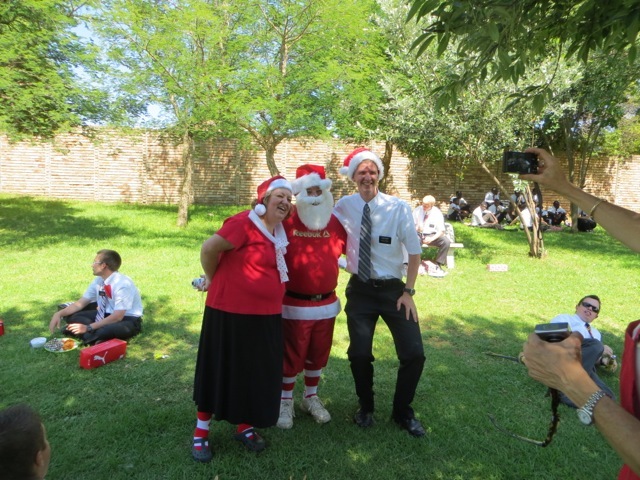 The Tanzeen elders who saw it last night as part of their Christmas program were the first in South Africa to see the movie, and we were the second. 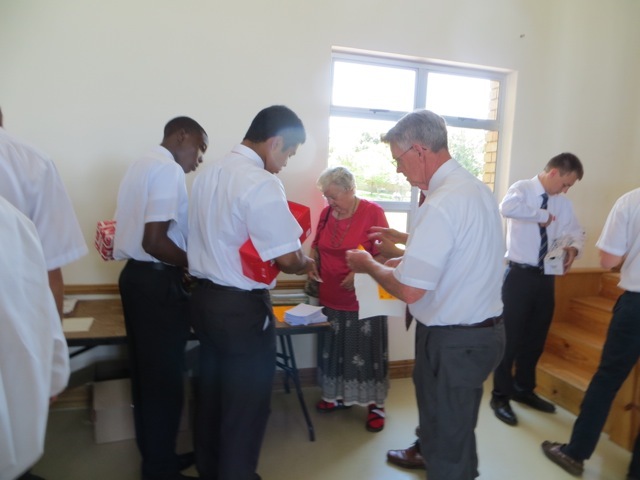 All the elders got a sticker to put on the back of their name tags with all the important phone numbers – this was in case they got robbed and their phones were taken they would have the mission number to call for help. 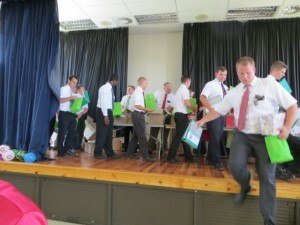 When the program was over all the missionaries filed into the cultural hall where they got a new lunch sack that was full of more goodies and a new mission binder that had all the important information about the mission. One of the elders took the short cut off the stage while elder Johnson let me take one more picture of him and his hat! When we are home in Provo for Christmas we usually share breakfast with 15-20 family members. This year we got to share our Christmas breakfast with 150 or so elders and 6 wonderful senior couples. 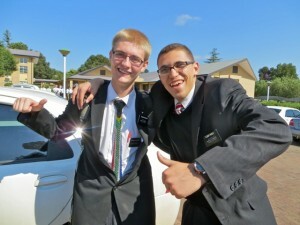 All morning I wandered around taking pictures – 183 total – some were because we served with or knew the missionaries. 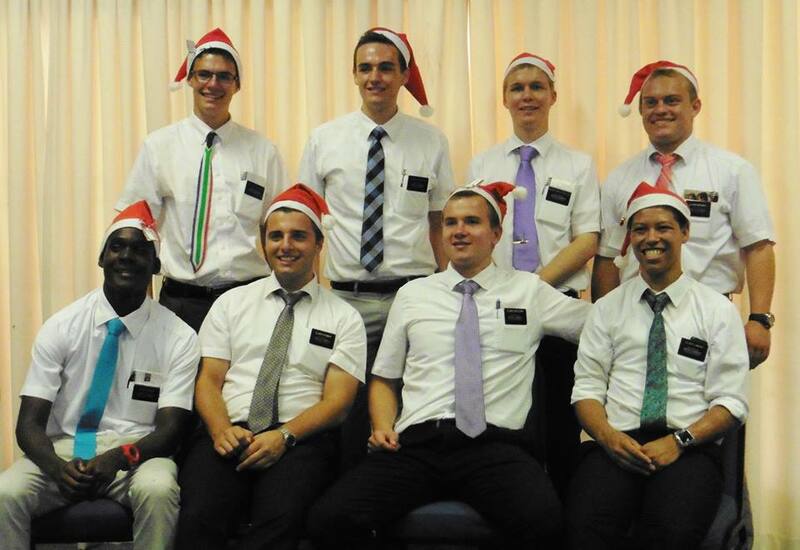 Some I took because of the great ties or hats they were wearing and of course with some I killed two birds with one stone. 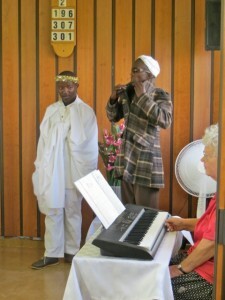 Elder Nwokendi was the first one I took because of his great horns. Elder Riley had one of the most imaginative hats – Santa stuck going down the chimney. 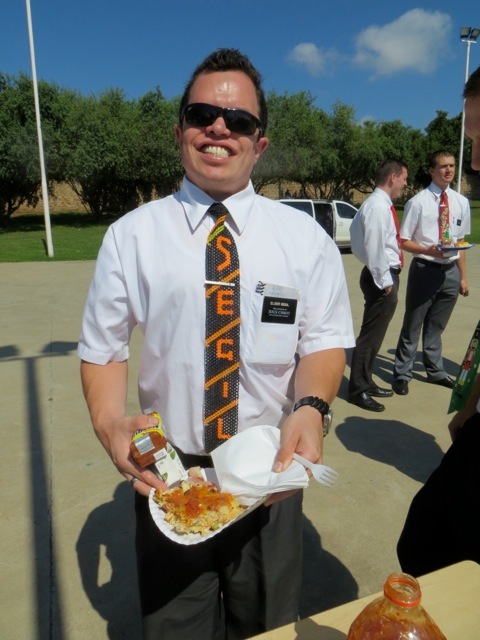 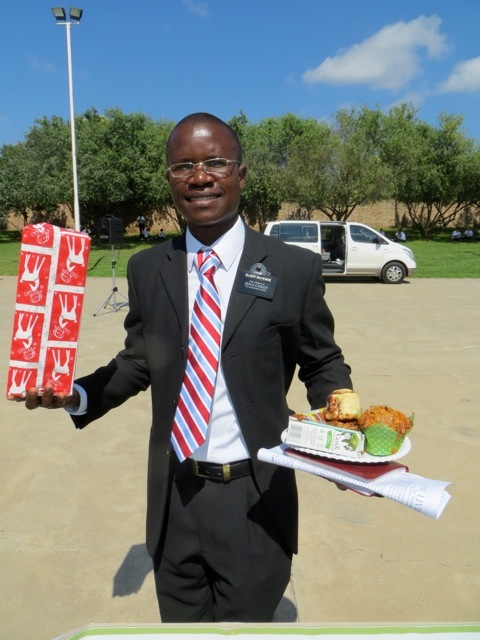 Our friends elder Segil is always easy to spot because of his tie – he is also showing off the plate of food each elder received. 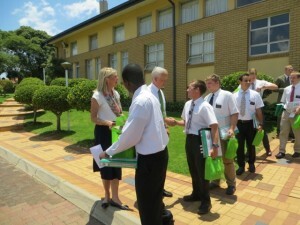 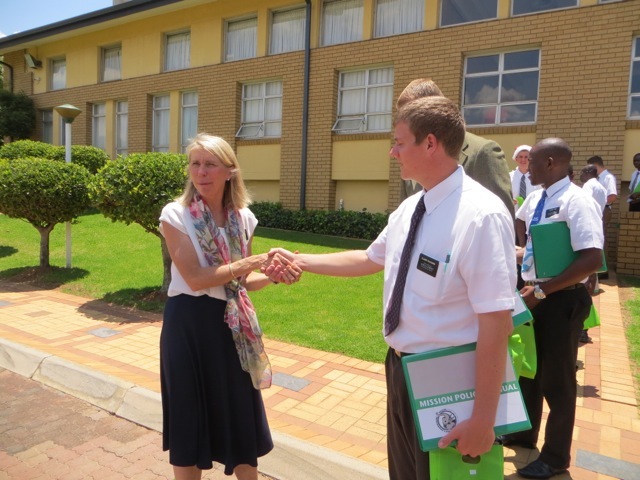 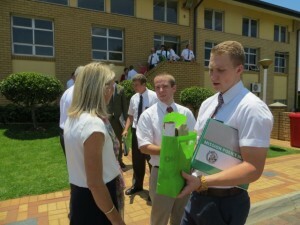 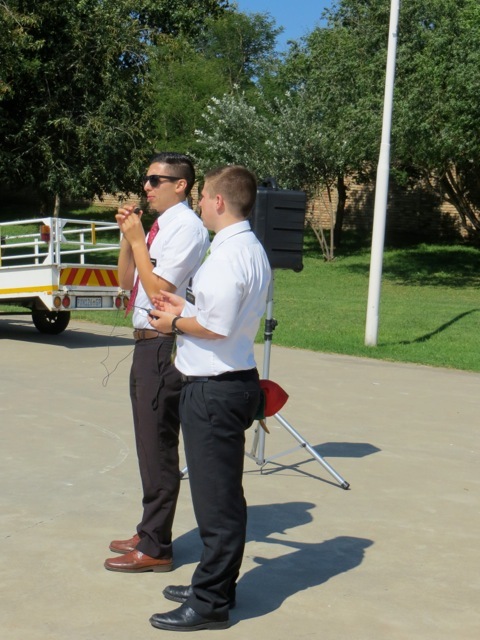 Elder Whitesides serves in the Vaal zone and we inspect his flat. 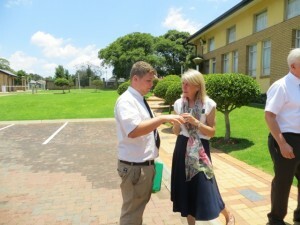 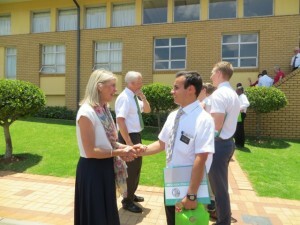 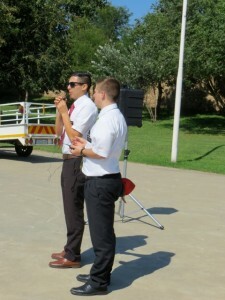 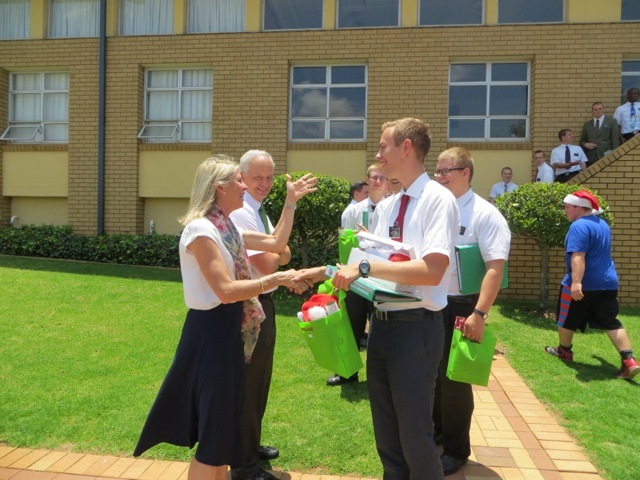 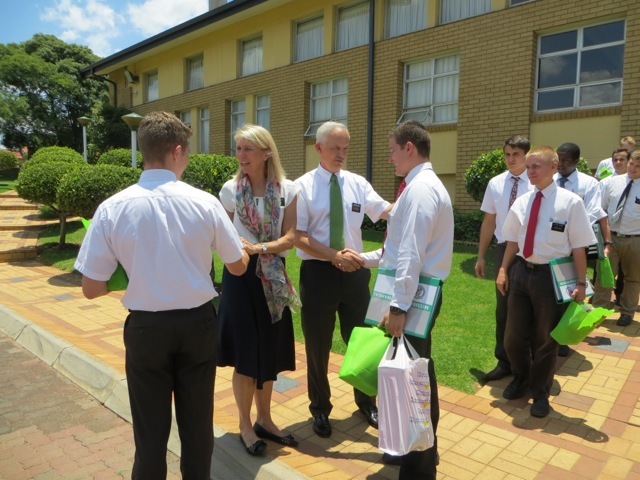 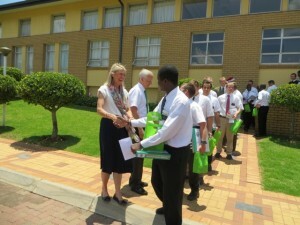 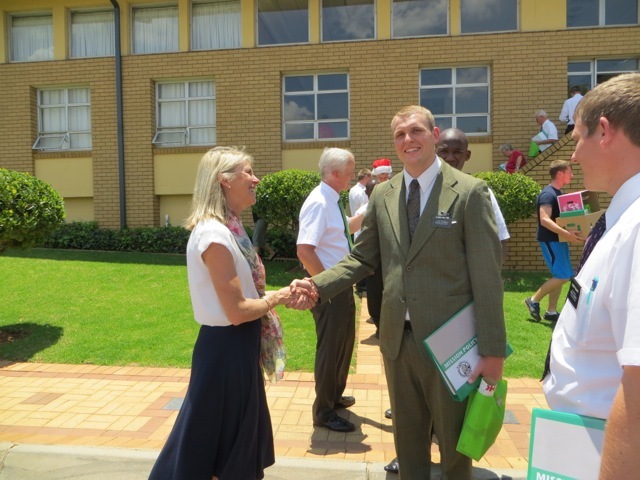 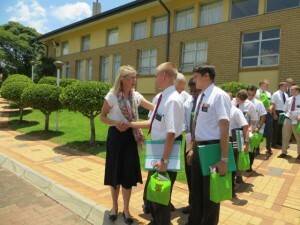 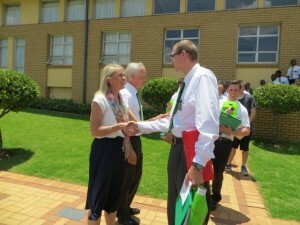 Besides his companion is elder Rogers who served with us in Potch. 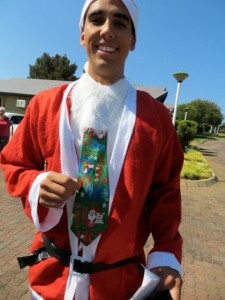 Not only was his tie spectacular it also played Christmas carols. 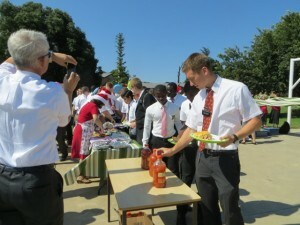 Elder Clegg went conservative on his tie choice but he was anything but conservative with his plate of food. 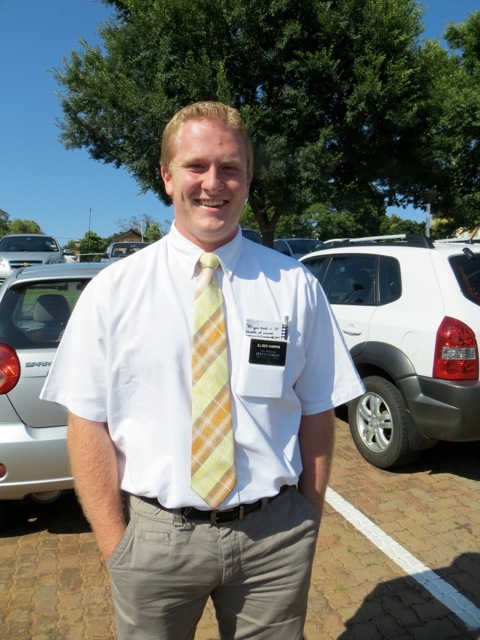 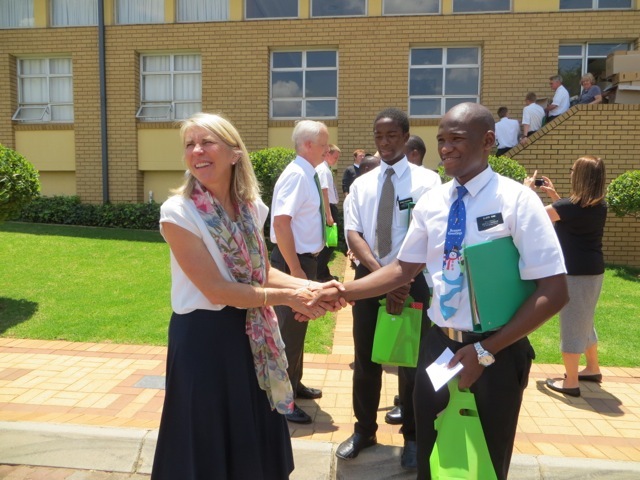 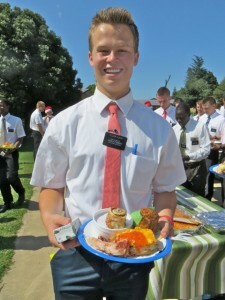 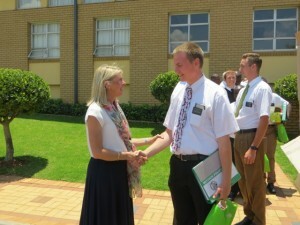 Elder Harris served down in Klerksdorp and we miss his smile but we know he is doing a great job in his current area. 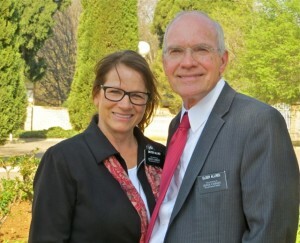 The only red head in the mission is elder Johnson who as far as I can tell has been at every large group meeting we have attended. I kidded him that he needed a red hat to go with his hair. 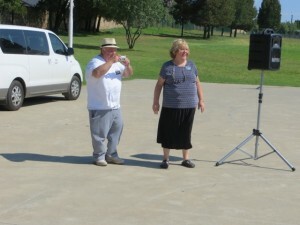 Later you will see that he did found one somewhere. 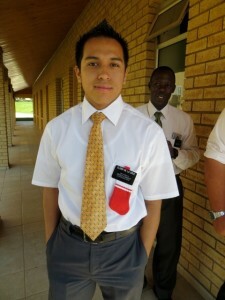 Our dear friend Elder Perez was one of the few that showed up in a suit. 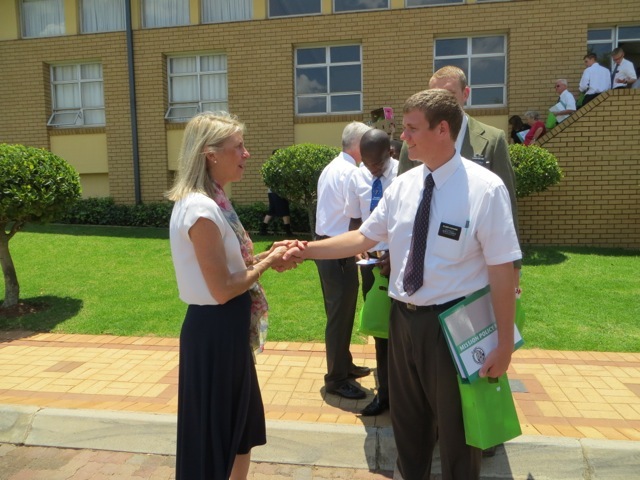 We really miss him but he is doing a great job as district leader in Witbank as the Lord knew where he needed to serve his last 3 months. 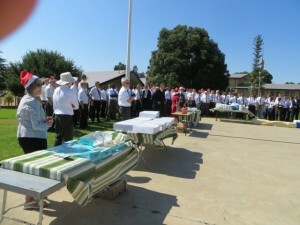 When the elders were all assembled for breakfast president Dunn asked one to give an opening prayer and a blessing on the food and the stampede begin. 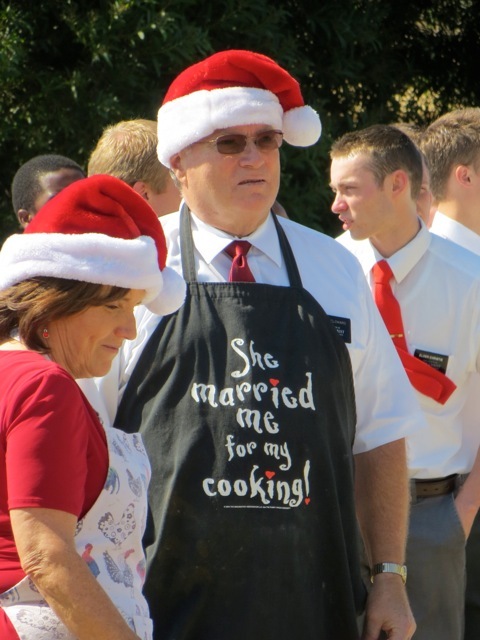 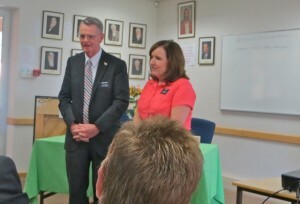 The couples dug in and served – big missionaries like elder Lyon need lots of fuel to keep going. If you look closely there is elder one of the Vaal zone leaders – elder Togiatomai, our friend elder Harris not smiling – which is really unusual, elder Perkins who served in the district, and elder Nwokendi stands out because of his horns! 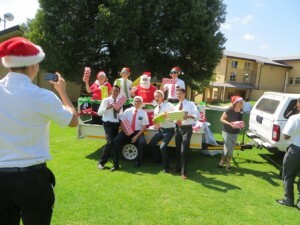 Since it is summer in South Africa Santa used his SuV and trailer instead of a sleigh. 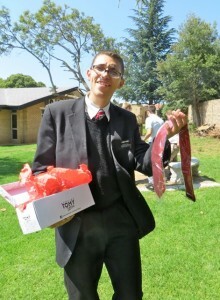 Each elder was given a wrapped Christmas present. 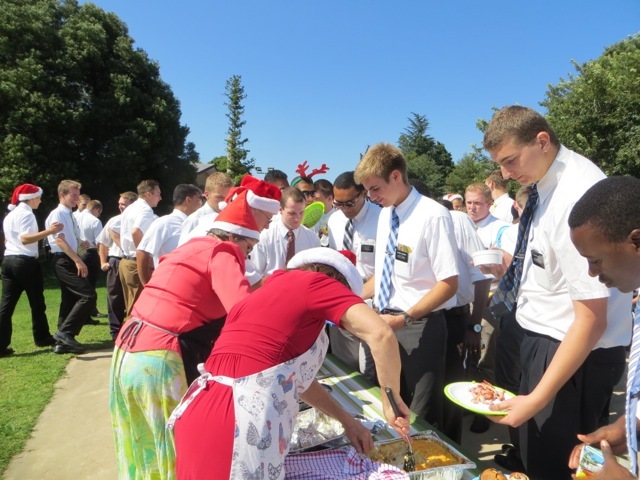 See the post above on how these came about thanks to the sisters Shaw and others who pitched in to make sure each elder has some present for Christmas. 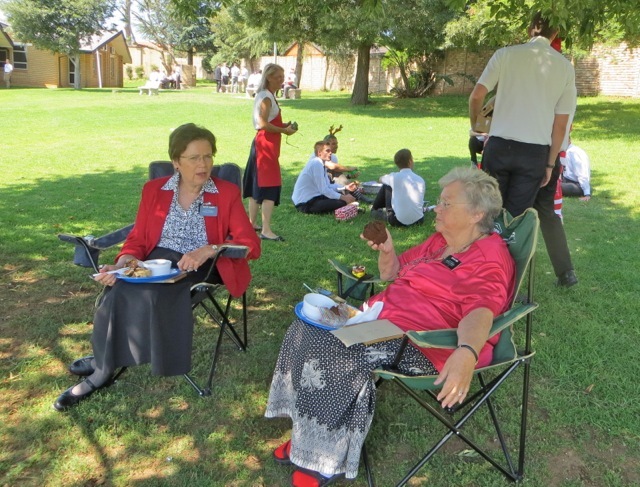 Mary and sister Dummer enjoyed breakfast while eating in the Dummer’s folding chairs that they keep in the trunk of their car. 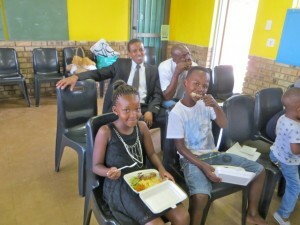 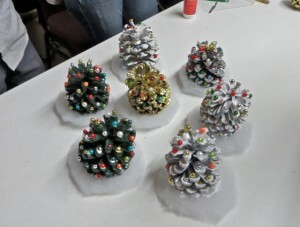 If I can get the blog to cooperate I will post some pictures from our FHE with the Young Single Adults. 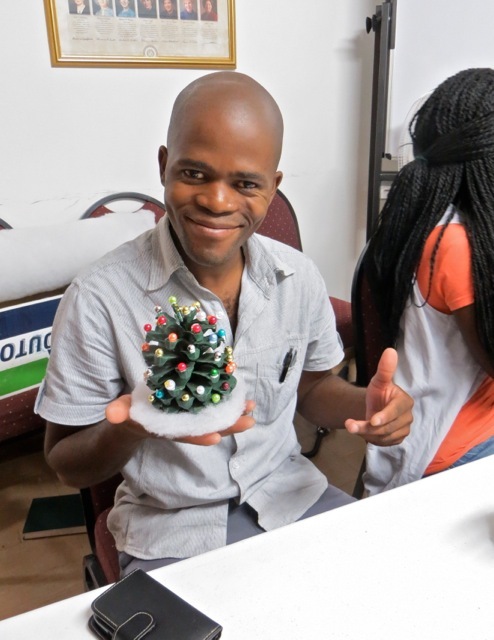 We had a great time watching ‘The Fourth Wise Man,’ singing rousing renditions of the 12 Days of Christmas, creating personal Christmas Trees from pine cones and just enjoying the fellowship of the Saints. So everyone now has their own designed and created Christmas tree that they can use year after year until they get a bigger one and then they can hang them on that tree. After the meeting the sisters could not leave without posing for a special shot! 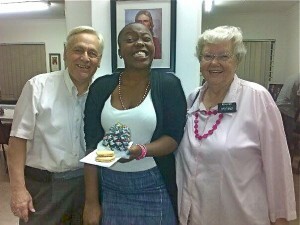 Charmaine wanted a picture with us as a reminder of the night. 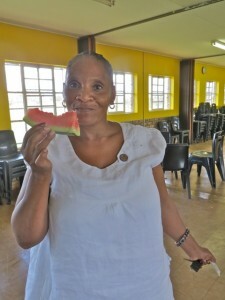 She lives in Pretoria but she will be here for Church on Sunday before going back home. 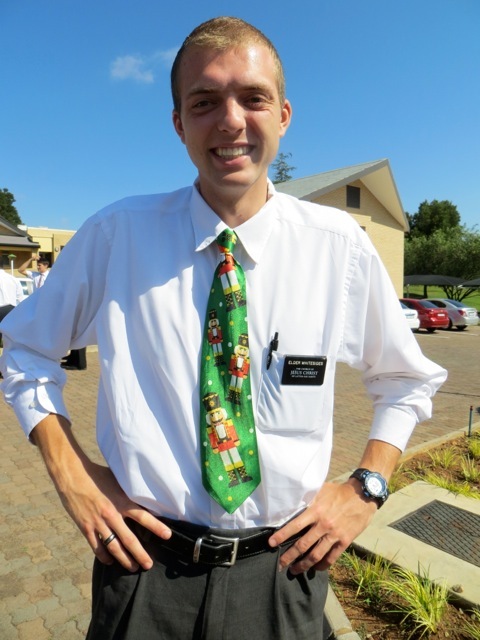 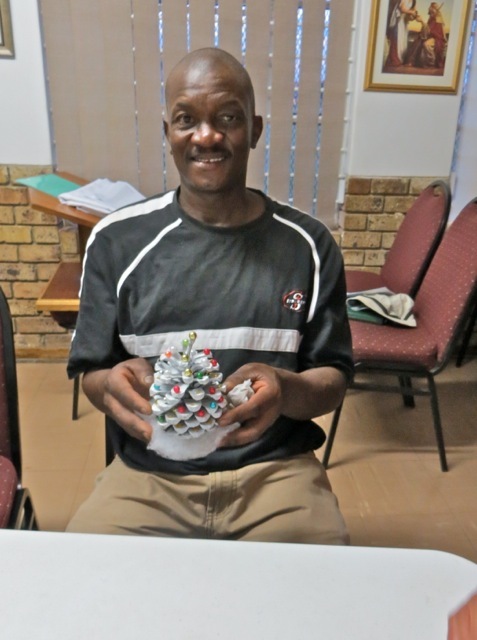 This entry was posted in Johannesburg Mission - Back To Africa on December 22, 2014 by Bill.